I'm pretty sure I gave the sweetest lecture ever last night, or at least to the sweetest audience in the sweetest environment. 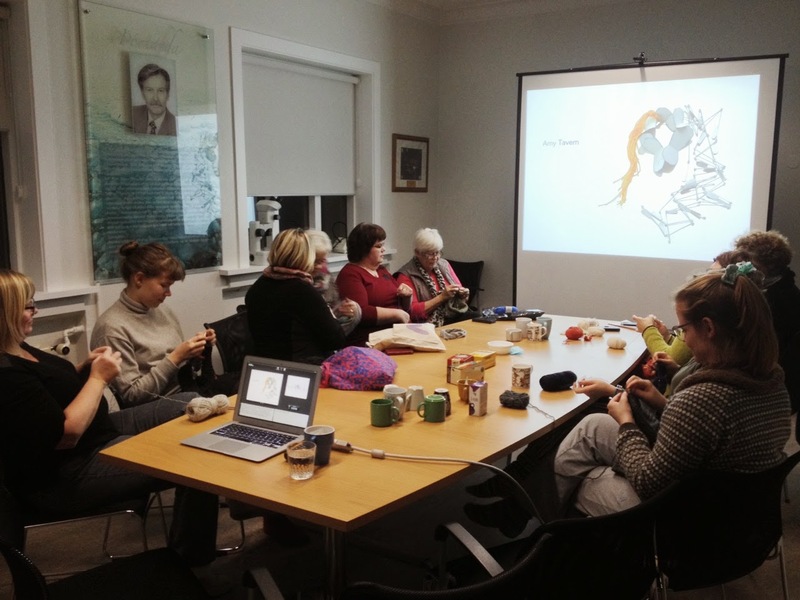 I spoke to a crowd of Icelandic women during their monthly knitting club night as well as the four other resident artists, all textile artists from Denmark. Jóhanna Erla Pálmadóttir, director of the residency, translated for me as I showed my images, and while all those ladies knitted. As they worked, they would look up at the screen, look to me, knit, nod their heads, and occasionally say já, Icelandic for "yes." I spoke in a simple way so that Jóhanna could translate easily, which was also good for me. I tried to find just the right words, to say the most important stuff. When it was over, there were some questions and comments and I enjoyed connecting with them a little bit more. Jóhanna told me that even though some of them couldn't understand everything, they could feel my emotion. They said they could tell I was giving them a lot. This felt amazing and made me a little bit teary. Then I grabbed my own work, the embroidery I'm working on here, and sat with them for about an hour, all of us working on our own projects and chatting. We talked a little bit about the volcano that is erupting right now and about Eyjafjallajökull, the volcano that erupted in 2010. I was congratulated on how well I pronounced it and then was taught to say a few more things in Icelandic. I was also told my new embroidery reminds them of lava, and I took that as a very high compliment. Last night is now among my favorite moments in Iceland. What a beautiful experience! I'm loving reading about this new adventure. Sending you love from the PNW!